"I lost my best friend of fourteen years the other day. His name was Stalker; or WTCH Casa de Carillo Stalker PATDcs, HTCH SKC International Breed Champion; if you want to get fancy. Stalker was a big red and tan male Australian Kelpie Dog, the premier herding breed of the Australian Outback. And as the flood of memories come rushing back, the lessons he taught me become clearer. This is Stalker’s story." I wanted a Kelpie. 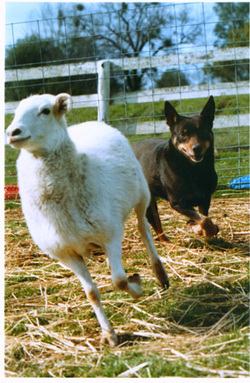 I vowed that when I finally had the place to keep enough livestock to entertain one that I would get a Kelpie Dog. I had become involved in the sport of herding with my Australian Cattle Dogs. Wonderful as they were, they were hard-headed, tenacious and self-serving. When it came to competitive herding competition this attitude was not the answer. In my naiveté I was sure a Kelpie was an easy fix. Obviously I had a lot to learn and the lessons were about to begin. Rottweiler puppy then a Kelpie, and as I found out over the years the stomping was a trait that always told me he was right and I was an ignorant human that should just sit in the house and mind my own business. It was love at first site. could ever hope to know. Thus the battle begun. My thoughts about how easy it would be to work a Kelpie went right out the window with my dreams of having a competitive trial dog. We argued, we fought. He stomped his feet, I yelled. He barked at me, I cried. And neither one of us two stubborn redheads gave in. My first trial was a disaster. The sheep were let out at one end of the arena. I walked in with Stalker and they jumped the fence with him standing at my side. The stock handlers tried to let them out again and the performance repeated itself. The stock wanted no part of this big bold dog standing 200 feet away. I did not understand the power and presence this dog had at the time and how it would make him one of the most powerful dogs on stock I had ever seen. The second trial was not much better. As Stalker was doing his lift one ewe foolishly turned around and stomped at him, then struck at him with her foot and caught him on the top of her head. And just as quickly Stalker took her by the nose and flipped her on the ground. He never hung on…just flipped her over. "Thank you" said the judge and I left the arena chagrined, with my dog that had blood dripping down his head. pleased. This was not what I had pictured at all. One of us had to adjust our attitude and I had a feeling it was not going to be that Kelpie Dog. Kelpies were not that common back then and most of the trainers I talked to had worked Border Collies but did not know what to tell me about this Kelpie's attitude. loud and clear. So I started to listen to what he was saying. I stopped yelling, I stopped trying to keep him off the stock and I stopped fighting him. In short I observed that he did truly know more about stock then I did. So I shut up and let him teach me. The transformation was amazing. He relaxed, I relaxed. He stopped barking at me and I stopped crying. We were a team at last and we were now the best of friends. I applied the same techniques to my Cattle Dogs and watched the transformation in their attitude. There was no stopping us now. blue ribbons in the world. the Silver Bullet Trial. How no other dog was allowed to block his vision of the livestock and were severely disciplined for it. How he made up for my inadequacies as a human and continued to teach me over the years how to become a better dog handler. I could not have asked for a better mentor. Stalker was thirteen when he really started to slow down and enjoyed sleeping in a favourite spot he dug in the dirt. He didn’t come down to the sheep corrals much anymore content to let the young foolish dogs take over his chores. One afternoon in the summer of his thirteenth year I was very despondent over some personal issues. A summer storm had hit that morning and Stalker and I walked down to the sheep pens. A miracle had occurred there. Thousands of Monarch butterflies had appeared out of nowhere. They landed on me and I knew things would be okay. the summer and had shown no interest in working the sheep at all. Two days after Christmas I was using Burr, one of Stalkers grandkids, to bring in the sheep. Burr was a foolish seven month old and as only youngsters do was making a mess of things. I was at the top of the hill with the pup and sheep when to my surprise I saw Stalker making the 400 or so yard climb up the hill to me. His tired old legs showed renewed vigour in his determination to make the climb. Without question or command he took over for the pup and helped to take the sheep to the barn. When we reached the barn and the sheep were put away he walked off and turned around to look at me. What passed between us at that instant I shall always remember and I knew at that moment it was the last time we would work as a team. The next morning Stalker did not eat and he could barely get up. We both knew it was time. I had to allow this proud dog to die with dignity as he lived. Choking back tears I called the vet and made the arrangements. As I helped my friend in the pouring rain from the warehouse to the car to make the drive to the vet, a single Monarch butterfly landed on my shoulder. I was reminded of the gift I had been given from God of the last fourteen years with this noble animal. I knew we would someday meet again.